Surf, sand, sun and now, spin! The Hotel del Coronado is now offering a unique spinning experience — right in front of its iconic property on Coronado Beach. Dec. 23 the rider with the ugliest holiday sweater will win Christmas dinner for four, and on Dec. 30 in a special “Evening Disco Spin,” the rider with the best disco costume will win two tickets to the New Year’s Eve “Crown Club” party. Classes are $25, $15 for Club at the Del members and are offered weekdays at 6:15 and 7:30 a.m. and weekends at 7:15 and 8:30 a.m. For schedule and reservations, hoteldel.com/events/beach-spin or (619) 522-8490. 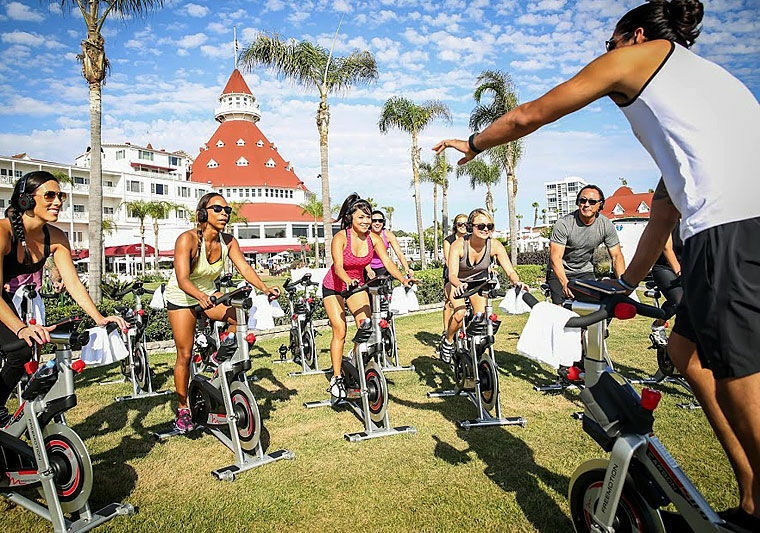 Hotel del Coronado offers spin by the seashore.